To Make It Easier To Visualize The Zika Virus, This Scientist Drew A (Brightly Colored) Picture : Goats and Soda He's a scientist. And an artist. His latest subject: the Zika virus. The two pinkish spheres are the Zika virus (the one at left is depicted in cross section). Surrounded by blood plasma molecules, the virus is shown interacting with the receptors, colored green, on the surface of a cell. 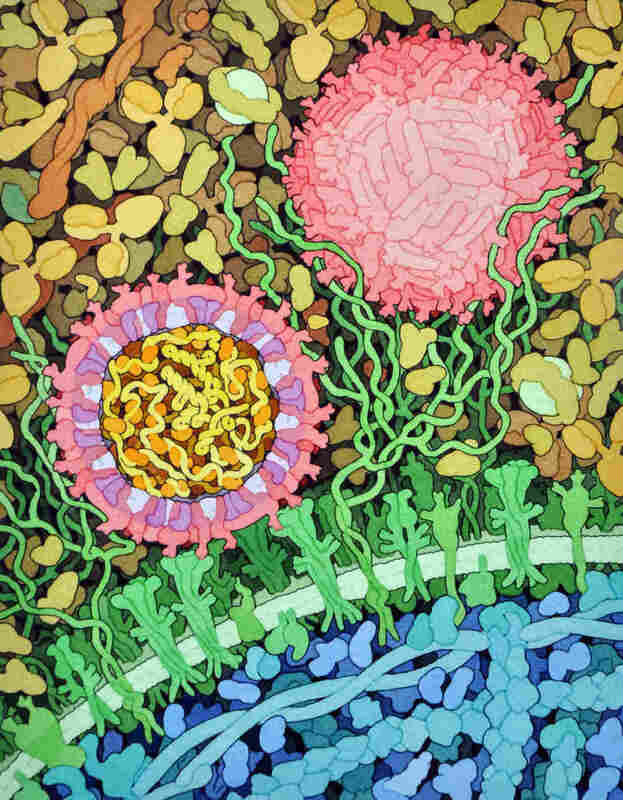 A watercolor by scientist-artist David S. Goodsell just might make the Zika virus easier to visualize. The painting, which depicts an area about 110 nanometers wide (a nanometer is a billionth of a meter), shows the virus in the process of infecting a cell. Zika is primarily transmitted through the bite of an infected female Aedes mosquito. Though the virus was originally discovered in a rhesus monkey in Uganda's Zika forest in 1947, the first study determining the structure of the virus was only published in March of this year. Goodsell used this research from the Purdue Institute for Inflammation, Immunology and Infectious Diseases for his painting, which shows the spherical pinkish Zika virus (also appearing in cross section at center left) advancing on a blue cell by binding with the cell's squiggly green protein receptors. Surrounding the spherical virus are tan blood plasma proteins; within the virus is a tangle of yellow genome and orange capsid proteins. Of course the comic book-bright structures shown in the painting aren't so simple and colorful in real, microscopic life. "These things are actually smaller than the wavelength of light, so they don't really have a color," Goodsell says. He chose his own color palette to highlight the function of each component — and to make them look beautiful. Goodsell, who is an associate professor of molecular biology at the Scripps Research Institute as well a research professor at Rutgers State University, started combining his artistic and scientific skills years ago while doing post-doctoral work at Scripps. He had the idea then to draw a cell and all that is packed within it, but computer graphics available at the time were not up to the task. "So I just jumped in and drew it myself by hand. I've been doing it ever since." To see more of Goodsell's paintings, check out the "Molecule of the Month" feature (Zika is the offering for May) at the RCSB Protein Data Bank, an archive of structural biology.